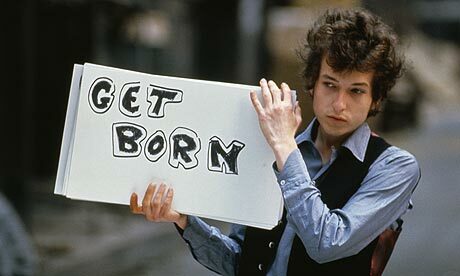 Let me be among the multitudes wishing Bob Dylan well on his 70th birthday today. I heard my first Dylan song on the radio in 1979 (“Gotta Serve Somebody,” then brand new), having up to that point only encountered his name in print, which I had assumed was pronounced Dye-lan. Anyway, at 15 I was immediately intrigued by his way with words and became more fascinated after reading about his stubborn determination to go his own way as an artist even when that proved unpopular. Not a bad role model. I went on to buy all his albums, see him in concert a dozen times (including last year in Ontario) and demonstrate my fannish devotion in many other ways. Question: What’s your favorite Dylan song or album? Mine would depend on my mood but I’ll go with “Most of the Time” and “Blood on the Tracks,” respectively. I was first exposed to Dylan in my British Literature (?) class at Damien High School. Our teacher had printed out the lyrics to “Hurricane,” a story that I was not familiar with as a 16 year old in 1995, and made us read along to the lyrics while he played the song on his CD player. Later that day I went out and bought the album, and played the song for my whole family. It is the first song that really moved me. A few years later they made the story of Rubin Carter a movie with Denzel Washington. It remains my favorite Dylan song.